World War II (1939-1945) - 1939: The deadliest conflict in human history officially began on September 1, 1939 when Nazi Germany invaded Poland (although technically it had begun two years earlier when Japan invaded Manchuria; and even Italy, an Axis Power, invaded Ethiopia two years prior to that). The winds of war had been building for much of the previous decade as several of the world's most powerful countries had become dictatorships with an eye on expansion...and revenge. World War I had ended with harsh terms imposed on Germany, and Adolf Hitler was not happy about it. As he rose to power (see Hitler above) he was determined to avenge Germany of its loss. He began by rebuilding the country's military in violation of the Treaty of Versailles. He was able to get away with it because much of it was done secretly, and though some of it had been monitored, no one was anxious to get into another war so soon after the previous one. This ambivalence emboldened Hitler to start making more aggressive moves. In March 1936, he sent troops into the Rhineland, another violation of the Versailles Treaty. France and Great Britain responded by largely looking the other way. Austria was annexed in March 1938. This time France and England voiced opposition, but made no move to reverse it. The Allied Powers had decided on a policy of appeasement. So the following month Hitler started making overtures toward the Sudetenland, a region of Czechoslovakia with a predominantly German population. This time the Western nations had to intervene. British Prime Minister Neville Chamberlain met directly with Hitler in September. Hitler made it clear that Sudetenland must be ceded to Germany or there would be war. Chamberlain gave in and the Munich Agreement was signed. He famously flew back to England, produced the document and proclaimed "peace for our time". That peace lasted less than another year when Hitler invaded Poland. But before he did, he secured a non-aggression pact with Stalin of Russia. That was the treaty that gave him the green-light on Poland. A full invasion into a sovereign country could not go unanswered, and on September 3rd, Great Britain and France declared war on Germany. 1940: Germany's first campaign of 1940 was into the Scandinavian countries of Denmark and Norway. Denmark fell in a single day and, despite support from the Allied Powers, Norway was defeated in two months. 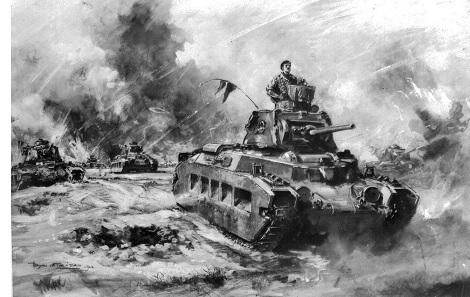 Combat in World War II was the exact opposite of what it was in the First World War. That conflict was marked by trench warfare; grindingly slow. Hitler, on the other hand, rolled over his opponents in a type of fighting known as Blitzkrieg (lightning) warfare. Dissatisfaction among the British public over the ease with which Norway fell forced Neville Chamberlain to resign in May. He was replaced by Winston Churchill. The very same day Churchill became Britain's prime minister, Hitler invaded France. France was one of the Allied Powers and had fought Germany to a standstill in World War I. Furthermore, after that war, it took steps to make sure any future attack by Germany could be halted in its tracks by building a massive fortification that ran the entire length of the border between the two countries. It was called the Maginot Line. It turned out to be a non-factor. Germany simply went around the Maginot Line by invading through Belgium. France had been conquered in six weeks. One of the famous events of the French invasion was the evacuation of about 300,000 troops (both French and British) at Dunkirk. They were ferried across the English Channel by whatever boats available, both military and civilian. The German army had them surrounded and should have been able to kill or capture them to a man. Prime Minister Churchill called their safe evacuation a "miracle of deliverance". The signing of France's surrender on June 22 was said to be the most satisfying moment of Hitler's life. He chose the train car, known as the Compiègne Wagon, the very same spot where Germany surrendered in 1918, as the location for the armistice With the defeat of France, Nazi Germany controlled the whole of Western Europe with the exception of the British Isles (and the Iberian Peninsula which stayed out of the war). At this point and for the next year, Great Britain would be the sole power fighting the German war machine. In a bold, yet controversial move, Churchill ordered the destruction of the French navy off the coast of Algeria fearing it would fall into Nazi hands, and be used in an invasion of England. It resulted in the deaths of 1,300 French sailors. But to countries like the United States, it demonstrated Great Britain's refusal to surrender or make peace with Germany. In fact, Hitler did offer an armistice with England. He would leave England alone so long as it did not interfere with Germany's conquest of Europe. Churchill refused. 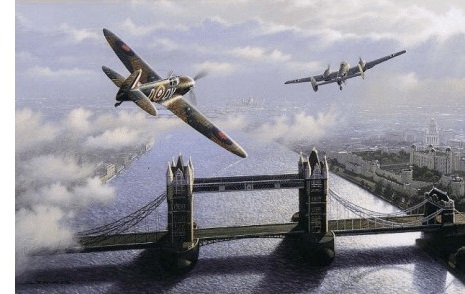 And so in July, the Battle of Britain began. Despite continuous air raids by the Luftwaffe over the next several months, Great Britain would not yield. The RAF wore down the Luftwaffe, and by October, Hitler had to abandon his planned invasion of England. 1941: 1941 began with the Axis Powers riding high and the Allies reeling. In fact, Great Britain was the only Allied Power still standing and the Axis were very close to victory. In the East, Japan was conquering virtually unopposed. The island nation had briefly been at war with the Soviet Union, but the two countries made peace after the Battle of Khalkin Gol (a battle won by the Soviets), leaving Japan with no significant enemies. But things began to change in 1941 based on the Axis Powers' own actions. And, although they would end 1941 with even more territory in which they began, their decisions would ultimately sow the seeds of their own defeat. In Europe, Hitler, frustrated by his inability to break England, turned his attention East, and violated his non-aggression pact with Russia. He invaded on June 22, 1941 in a campaign codenamed Operation Barbarossa (named after Emperor Frederick I). Well aware of Napoleon Bonaparte's failed invasion, Hitler was determined not to make the same mistakes. Mainly, instead of going straight for the capital, he divided Soviet territory into three targets and would take all three. In Moscow, Stalin was caught completely off-guard and was said to have suffered some sort of mental of emotional breakdown. The Nazi army initially conquered at will. Within the first two weeks, the Luftwaffe achieved total air superiority and the army advanced about 500 km (311 miles). The Soviet military was finally able to mobilize a defense and meet the Wehrmacht at Smolensk on July 10th. Although they were defeated, they managed to slow the German advance by about two months, which was significant. Besides Moscow, the two other targets for the Nazis were Crimea and the Baltic states. Those objectives were achieved by October, but Moscow still remained. German troops approached the city in November, but the delay at Smolensk proved critical here. The weather had turned cold and the notoriously harsh Russian winter was setting in. That and the fact that the Soviets were able to fortify Moscow with fresh reserves led to the first defeat of Operation Barbarossa (in fact, it was the first German loss of the war, not counting the cancelled invasion of England). The Battle of Moscow was not only a strategic setback for Hitler, it was also a psychological blow for his troops. They began to recall the French defeat 129 years earlier and wonder if the same fate awaited them. In early December, the Nazis withdrew from Moscow and the Soviets were emboldened and began a counter-offensive. By this time Great Britain and the Soviet Union had entered into an alliance to defeat Germany. Winston Churchill knew well of Stalin's reputation for the murder and banishment of his opponents, but he said he would make a deal with the devil in order to defeat Hitler. Meanwhile, the day after Russia began its counter-offensive against Germany, the Japanese Empire attempted to foil any ideas of the United States to halt Japan's expansion in the Pacific. 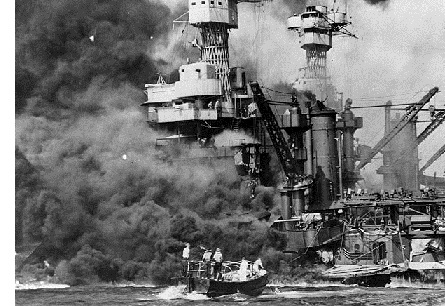 The Imperial Japanese Navy launched a pre-emptive attack on the US Naval Base at Pearl Harbor in Hawaii on December 7, 1941. Several ships, including five battleships were sunk, and about 2,500 lives were lost. The next day, President Franklin Roosevelt delivered his famous speech before Congress in which he described the attack as a "date which will live in infamy". An hour after the speech, Congress passed a formal declaration of war against Japan and the United States was pulled into World War II. Although he was hoping Japan would delay its attack, Hitler supported his ally and declared war on the United States on December 11. The other major theatre of war to erupt was in Africa. Mussolini had become resentful of Hitler's success and had been trying to gain ground in British-held North Africa. Although he had made some initial gains, Great Britain began to beat him back and Hitler had to send forces to bail him out. German troops under the command of Field Marshall Erwin Rommel arrived in Libya in February 1941. By March he launched an invasion that pushed Allied forces back toward Egypt. 1942: With the entrance of both the Soviet Union and the United States into the war, the Axis Powers went from having only one major opponent to having three. The enhanced Allied Powers agreed that the best way to defeat the Axis was one at a time, with Germany being the first target (actually they decided to concentrate on the European theatre which included Italy). However, they disagreed on how to approach the continent. The Americans favored a frontal assault through France, but the British convinced them that it would be too costly at this stage in the war. They favored an indirect attack through Africa and then up through Italy. Eventually they persuaded the Americans of this approach. Axis Europe was compared to a monster that was vulnerable from beneath. And so the initial assault would come through the "soft underbelly" of the continent. In Africa, there was a significant conflict in 1942 which made the "soft underbelly" strategy much more feasible. The 2nd Battle of El Alamein pit two of the most renown generals of the war against each other; Rommel versus Bernard Montgomery. Montgomery was victorious (though he had about a 2:1 advantage in men and machine). For the first time, Germany had become over-extended and had to pull back from Africa. It was so important that it caused Winston Churchill to say, "Now this is not the end. It is not even the beginning of the end. But it is, perhaps, the end of the beginning." In the Pacific, a conflict at least equally as important took place at sea. After Pearl Harbor, Japan had about a six-month window in which it had free-reign over the ocean (pretty much what Yamamoto had predicted). Despite the amount of damage done at Pearl Harbor, the United States got one fortunate break; on the day of the attack, its aircraft carriers were out on maneuvers and escaped damage. So the bulk of its Pacific fleet was still intact. Not only that, but in World War II, the aircraft carrier replaced the battleship as the king of the sea. With planes, it had far greater reach than anything else that put to sea. In June, the pivotal Battle of Midway was fought. It featured three US carriers against four Japanese carriers. In the end, all four Japanese carriers were sunk, while the US lost only one carrier. It was a devastating loss for Japan and marked the end of Japanese hegemony in the Pacific. It also marked the end of Japanese expansion and for the rest of the war, it was forced into a defensive posture. Despite being an industrial power, it could not match America's industrial might and Midway proved more costly to Japan than Pearl Harbor was to the United States. Back in Russia, the Soviet counter-offensive launched at the end of 1941 didn't go very far. Germany halted it at the Battles of Kerch Peninsula and Kharkov (2nd Battle of Kharkov technically). When summer rolled around, the Nazis tried to complete the conquest they began the previous year. But by this time the stakes were raised considerably. An extra year in Russia meant Germany was burning through its resources more quickly than it hoped. The mechanized Wehrmacht desperately needed oil. So this offensive included a push toward the Caucasus Mountains in Southern Russia which were rich in oil. There the decisive battle of the Russian campaign, perhaps of the entire European theatre, took place at Stalingrad. It was and remains the largest tank battle in the history of warfare (recall on the timeline that the Battle of Kadesh was the largest chariot battle in history). It ended in a loss for Nazi Germany and was roughly equivalent to what Midway was for Japan. From that point on, Germany began to lose territory and, like Japan, was forced into a defensive posture. 1943: 1943 began with, for the first time in the war, the Axis Powers on defense and the Allies on offense. However, the newcomer to Europe, the United States was still getting its war legs. When American soldiers first landed in Africa, they were slaughtered at the Battle of Kasserine Pass. Based on this, Germany didn't think the US would make a significant contribution to the Allied effort. But the GIs adapted quickly and soon proved their worth. Germany tried, one last time, to seize the offensive in Russia, but its resources were just too depleted, and the push was short-lived. By July, the Wehrmacht was in retreat on the eastern front, this time for good. Part of the reason was because it had to re-allocate troops to the West after the Allies invaded Sicily in the same month (this was the campaign in which my uncle fought and died - see Robert Craig above). The Sicily campaign would lead to Italy's early exit from the war; and about two weeks after the Allies landed, Mussolini was overthrown and arrested. Also, something new happened; the Allies began bombing the civilian population in Germany. The goal was to break the country's will to fight. July was the month things really started falling apart for the Axis Powers. Russia began its own offensive and started constricting Nazi Germany from the East. 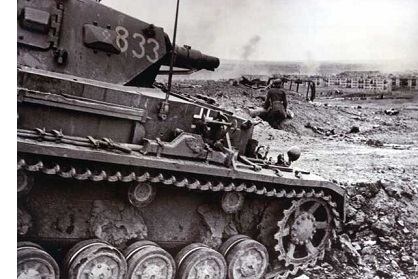 The Second Battle of Smolensk, the same location where the Red Army first slowed the Nazi advance two years earlier, resulted in another victory for Russia and accelerated Germany's retreat. Italy surrendered in September when Allied troops reached Italian soil. Sensing for the first time that victory was likely, the three leaders of the Allied Powers met face to face for the first time in Tehran to plan how to knock out Germany and then concentrate on Japan. And speaking of Japan, the Allies gained some unexpected help in the East. The Chinese National Revolutionary Army organized to the point where it managed to defeat Japan at the Battle of Changde. This surprise victory helped the Allied effort tremendously. 1944: In 1944, the Allies were finally ready to do what the Americans had wanted to do initially upon entering the war, invade France. It was known as D-Day (or Normandy Landing) and was one of the most memorable events of the entire war. 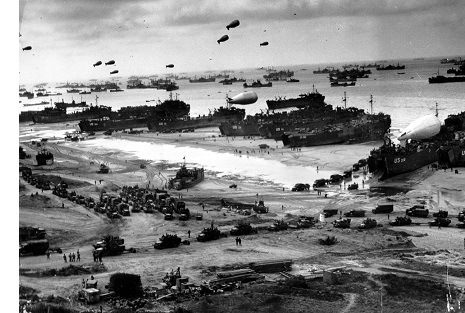 Codenamed Operation Overlord, it was the largest amphibious assault in history. On June 6th, 160,000 soldiers from 13 different nations landed on the beeches of Normandy in order to first expel the Nazis from France, and then push on to Germany (Berlin being the ultimate target). The invasion was a success and the Germans were once again fighting a two-front war. About the same time the Allies were advancing from the West, the Soviet army was clearing the Wehrmacht out of its own territory. By the end of June, it had pushed the Germans out of Belarus, and by the end of July, they were kicked out of Ukraine and back into Poland. On August 25th, Paris was liberated after four years of occupation by the Nazis. September saw the arrival of Russian troops into the Balkans, and in October, the Soviets invaded Hungary. Many of these countries, like Romania and Finland, shifted from the Axis to the Allied side once German soldiers were expelled or they were relieved of Nazi influence. Also at the same time Operation Overlord was advancing, the Allies were capturing territory from Japan in the Pacific. In a strategy which became known as "island-hopping", they targeted strategically important islands that were lightly fortified and bypassed heavily defended ones. With the bulk of their forces in the European theatre, they had limited personnel with which to fight the Japanese. Nevertheless, in June, the Allies launched the Mariana Campaign. They captured Saipan in July and Guam in August. In a naval engagement, the United States defeated the Imperial Navy at the Battle of the Philippine Sea, in which three Japanese carriers were sunk. The loss severely weakened Japan's hold on its empire of islands. From there American forces invaded the Filipino island of Leyte, followed by the Battle of Leyte Gulf. This was the time in which General Douglas MacArthur proclaimed, "I have returned!" (in reference to when he first retreated from the Philippines and said, "I shall return!"). The United States had now captured territory putting them within range of bombing the Japanese Islands. Before the year ended though, Germany launched one last massive assault at the Battle of the Bulge. The attack caught the Allies by surprise and inflicted heavy casualties, particularly on US troops. It was the single greatest loss of life to Americans in the entire war. The counter-offensive ultimately failed, however, and was in essence a last-gasp effort on the part of Nazi Germany. 1945: Early in 1945, with victory at hand, the three leaders of the major Allied Powers met again, this time at Yalta. They discussed post-war Europe and the occupation of Germany. Meanwhile, in February, Allied troops reached the borders of Germany for the first time; Russia from the east, the United States and Great Britain from the west. The race was on to see who would make it to Berlin first. Most of the high-ranking German officers, sensing defeat was inevitable, wanted to officially surrender to American and British troops, fearing the retribution the Soviets were likely to exact for the invasion of their country. Of course, many Nazi officials were trying to flee Germany altogether, in light of the war crimes tribunals that were likely to follow. By early April, Western Allied troops had crossed the Rhine River and Russia captured Vienna. President Roosevelt died on April 12th, and Harry Truman was sworn in as president. When the news of Roosevelt's death reached Europe, some in Germany thought this was the sign of a miracle victory to come. But his death did nothing to slow down the Allied advancement. The Soviets arrived in Berlin first, on April 21st; American and British troops four days later. On April 28th, Benito Mussolini was executed in Italy. Two days later, Allies captured the Reichstag building and Adolf Hitler committed suicide. His body was incinerated to prevent it from falling into enemy hands. Despite scattered fighting for several more days, the war was essentially over in Europe. Now Japan was the only Axis Power remaining. The United States began bombing Tokyo in March which killed about 100,000 Japanese civilians. It eventually expanded the campaign to include other cities over the next several months, which killed close to another 500,000 people. 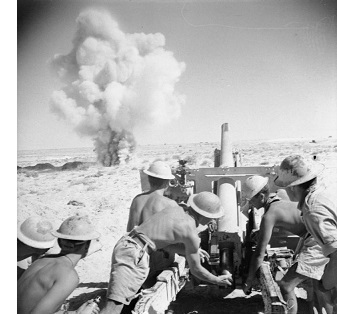 While the bombing campaign was going on, Allied troops were also capturing islands. 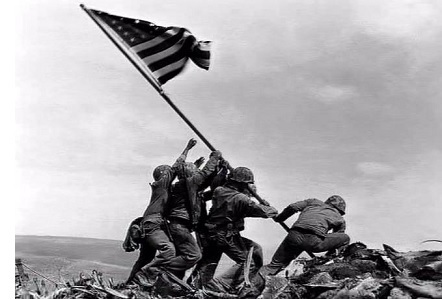 In March, US Marines won the famous Battle of Iwo Jima, one of the bloodiest conflicts in the Pacific. It was followed by the Battle of Okinawa. The Allies were preparing for a massive invasion of the Japanese Islands. However, Japan's refusal to surrender in the wake of such massive bombardment, convinced the Allies that an invasion would be extremely costly. So the United States introduced a new weapon into the war; the atomic bomb. On August 6th, a B-29 Superfortress named the Enola Gay dropped one on Hiroshima. It's estimated that between 70,000 and 80,000 people died instantly, and about that many more eventually succumbed to injures, primarily radiation burns, resulting from the blast. Japan still did not surrender. So on August 9th, America dropped another one. The same day, the Soviet Union declared war on Japan. On August 15th, Japan formally surrendered. This brought World War II to a close. When it was all said and done, upwards of 60 million people died as a direct result of the conflict, and remains the only event in which atomic weapons were used during wartime.